Home News It's over to leave your finger to send an audio WhatsApp! It's over to leave your finger to send an audio WhatsApp! WhatsApp is not for: new exclusive functions for groups, the possibility to delete messages sent within the first 7 minutes and now ojito because the most popular messaging app is unmarked with one of the most desired characteristics, to improve the audio recording . As you well know, audio recording is quite rudimentary: you simply hold the microphone and speak. Of course, you must keep the microphone pressed all the time or stop recording, something very annoying especially in long audios . And is that, despite being one of the most used tools by its users, it is a function to which WhatsApp had not yet implemented improvements. Until today. 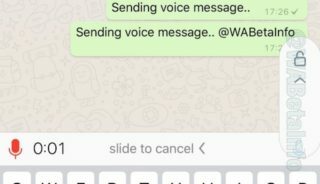 So, dear WhatsApp users, your prayers have been heard: finally we can record voice messages without having to press and hold the microphone button . So, how can we make audios on WhatsApp with the new function? Very simple, since the update is released, you can easily record WhatsApp audios simply by pressing the microphone button as you came doing it. But as soon as 0.5 seconds pass, a message will appear on the microphone icon that will prompt you to slide your finger upwards to leave it blocked and forget to press. Then you can continue talking without clicking anything and you can also continue using the app , for example to scroll through the chat and read specific parts of the conversation. What limitations will the new function have? We will not be able to see photos or videos while recording a message. We will not be able to write messages while recording a blocked audio. While we record an audio, we can not go to other chats , since the voice message will be deleted. When can we block the audio recording of WhatsApp? At the moment, WhatsApp is testing this feature , so even if you have updated to version 2.17.80 of WhatsApp, you still can not do it. It is expected that this news will come in future updates, when certain bugs have been corrected.